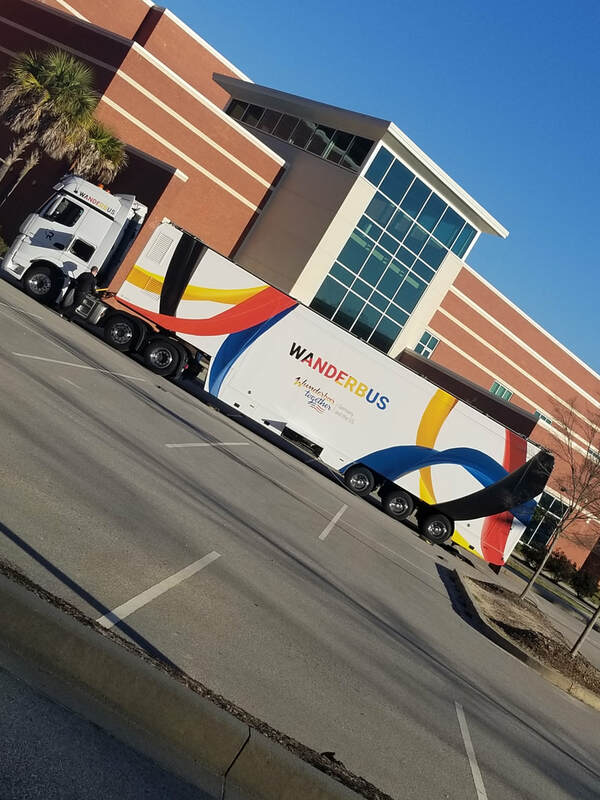 I must confess, when I first heard that the "Wanderbus" pronounced, "Vahnderbus" was coming to Riverbluff High School, I was a little confused and also curious. 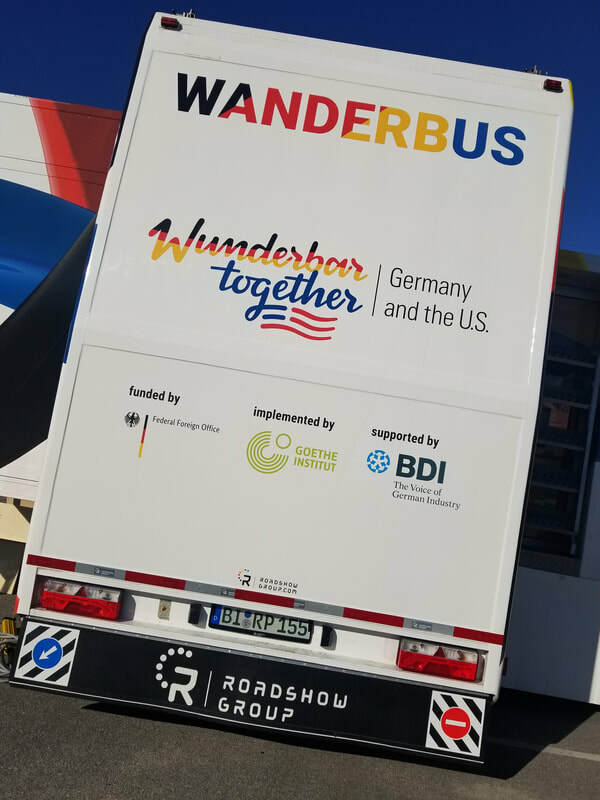 I thought to myself, "Hmmm...a bus that is driving across the United States to bring interactive resources about German language and culture will be parked in the parking lot of the high school?" I guess I was actually kind of picturing the Magic School Bus and Mrs. Frizzle with a German accent in my mind. But as the date drew closer, and I began to read more about the experience, I thought, "This is an incredible idea." And sure enough, on the day it arrived, I was truly impressed! I got there early, and saw the bus, shining in the morning sun, really more of a giant semi-truck. My excitement grew as I introduced myself and found out there were two representatives of the Goethe Institute, along with the truck driver, who have committed the next few months of their lives to bringing this experience to high school and college campuses across the U.S. As I watched them begin the set-up I felt like I was watching roadies for a famous rock band. 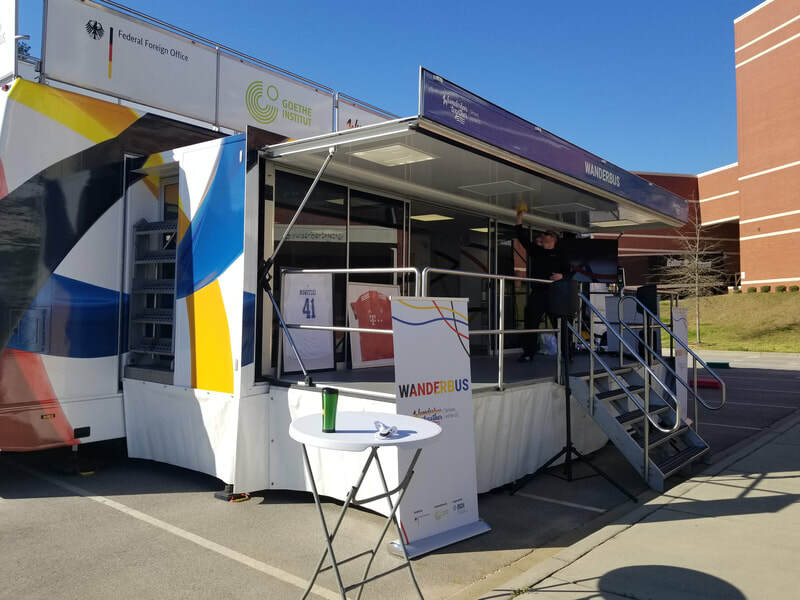 The sides of the truck opened up and before I knew it, there were virtual reality displays, a photo booth, iPads stations and many other interactive displays ready for students to enjoy. Inside the school, preparations had begun as well. Frau Buckliew and Frau Lopez had invited the German immersion students from DES to visit and buddy up with a high school German student as they experienced the Wanderbus. When I entered the school, to find out if they needed anything from me as the set up was going on outside, I saw a ring of students, both large and small, in the atrium, right next to the front office, chanting in German at the top of the their lungs, and Frau Buckliew in the center, leading the charge. I thought to myself with a smile, "Well, she sure knows how to make her German classes visible in the school!" Clearly, they did not need my help, as the teachers and students had prepared signs and other activities to welcome the bus. 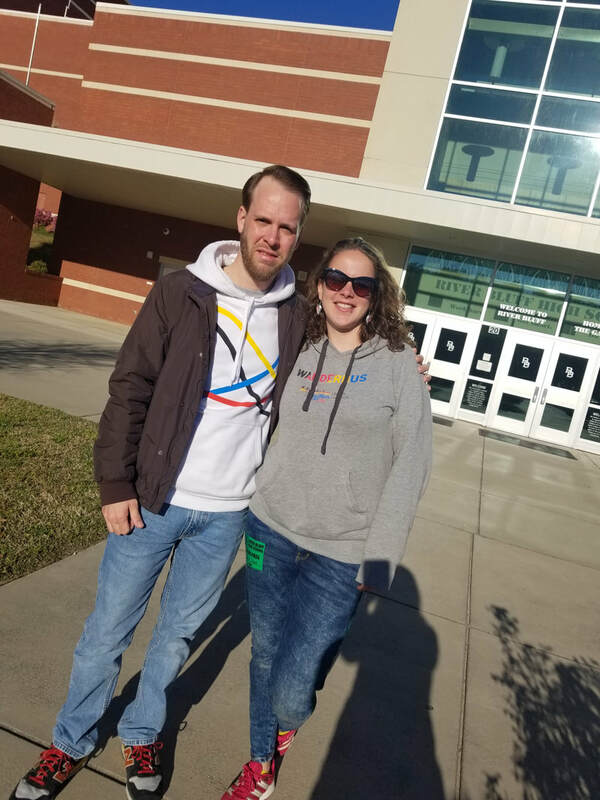 When they did finally make it outside to experience the event, I saw kids, young and old, experiencing virtual tours of Germany, learning the geography of Germany and building a "highway" out of giant puzzle pieces to experience the German Autobahn. In short, they were truly "Wunderbar Together" as the sign on the back of the bus stated. Thank you Fraus Buckliew, Lopez, Fretwell and Ward for all of your hard work and collaboration to bring this experience to your students. It was a unique and engaging experience that I doubt any of your students (or colleagues) will ever forget. 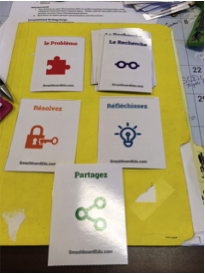 White Knoll French 4/5 students are following an intentional inquiry protocol developed by SmashBoard. 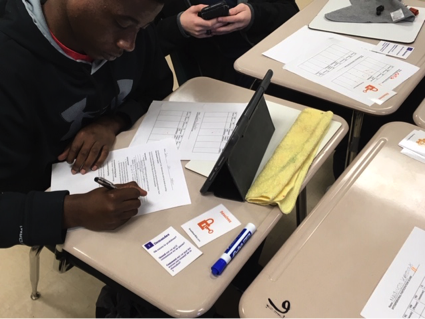 According to their website, "Smashboard Edu is problem-based learning & the design-thinking process smashed into a gamified experience!" The Goal is to creatively explain a solution to a relevant, real-world problem. With the invaluable help from Tiffany Miller, our school DLC, my students and I are embarking on a new approach to studying and analyzing the news. Then ​they worked in groups to answer questions and each student wrote a personal opinion about the issue, which had to include an opposing point of view. Finally, they will record their reflections of the process on FLIPGRID to share. It is an intense process, but they have really delved deeper into the issues than they normally would have. An interpersonal score is given for group discussions. An interpretive score for their use of authentic French resources, and two presentational scores, written presentational for their summary opinion and speaking presentational for their reflections of the process. Thanks Jill for doing such important and interesting work with your students. My question to you all is, how could you possibly modify this assignment to work for your class? Do you want to bring more L2 into your classroom? Have you heard of March Madness? In March there is a college basketball tournament in which 68 teams compete through 7 rounds and 1 national victor is chosen. During March Musical Madness students vote between target language songs. Don’t worry, we don’t do 68 songs. I played 24 songs last year and the French teachers at my school did a bracket of 36. Each day we listened to two songs for a bell work or exit slip. Every teacher puts their own spin on the brackets. So you can set up a twitter playlist or I’ve seen a Spotify playlist and students can watch their videos for homework and vote on them before class. We had our students listen to the songs at the beginning of class and either vote on a survey on Schoology or Google Form. Each class picked their winner. I have also seen some teachers make bulletin boards and all classes decide on which song moves on to the next round. 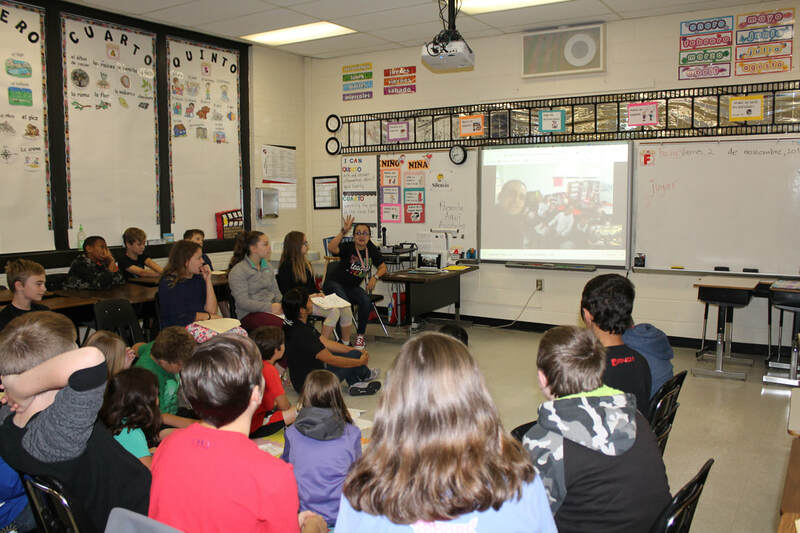 Students from fifth grade LOLA classes at Gilbert Elementary School established an online hangout with students from fourth grade in Fundación Colegio Santa Maria - Bogotá, Colombia. 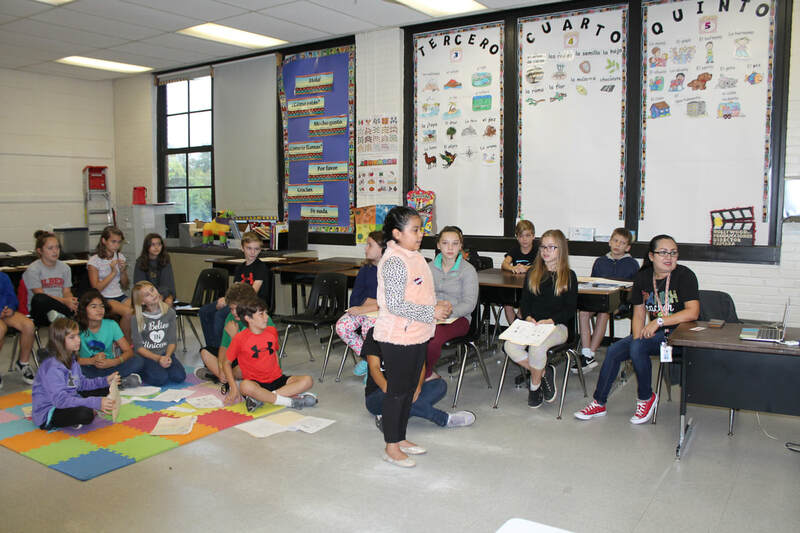 The Students shared information about themselves (family size and names) in Spanish and one student described a typical day at GES in English because the students in Colombia are studying this topic in their English class and wanted to hear it from an English speaker. He mentioned the subjects, schedule and school routine. Carrie Blackwell also shares her fourth graders at Forts Pond Elementary who celebrated finishing performance assessments by learning a hand-clapping game. They just completed a unit about the cacao tree and how chocolate is made. Songs, chants and kinesthetic activities help reach the whole child, and give them a chance to participate in physical activity, while also creating neural pathways. Great job LOLA teachers! GHS: Oh the Places You'll Go! ​GHS has had some busy days during the past month and “Oh, the places you’ll go!” by Dr. Seuss comes to our minds when we think about it. There were lots of meaningful activities going on in all classes and it seems like “travel” was the word of the month, whether virtually or physically. 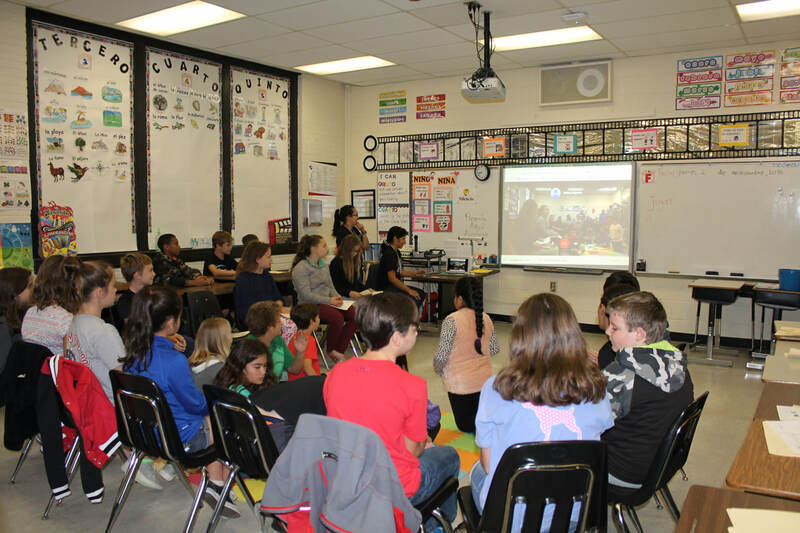 The French classes virtually travelled through the francophone countries using tools like Storymaps and Google Expeditions, but also by interacting with the two ambassadors from USC Thinking Globally, that they welcomed as guest speakers. 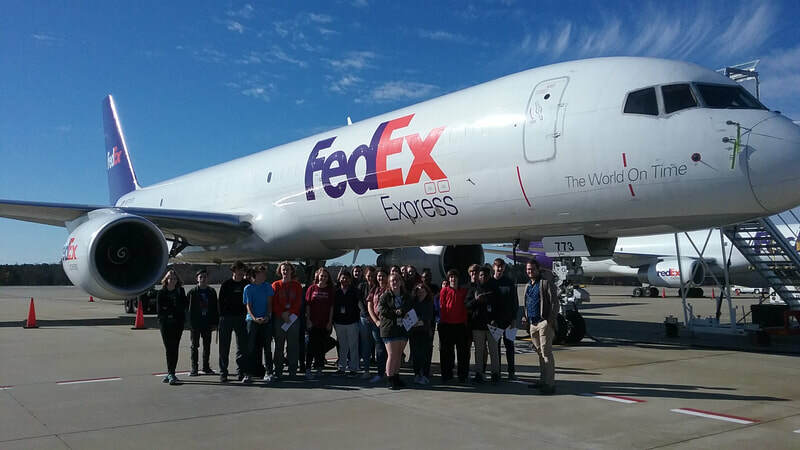 The students also travelled to the Columbia Metropolitan Airport for a tour of the facility where they got to see planes land and take off right next to them on the runway, and talked about possible careers in aviation, thus making connections with the importance of learning at least one more language. 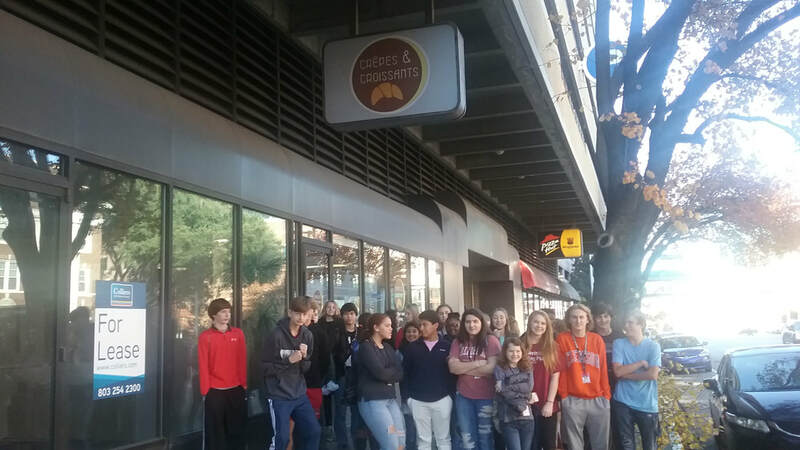 Then they tasted authentic French food at Crêpes and Croissants, in Columbia SC. 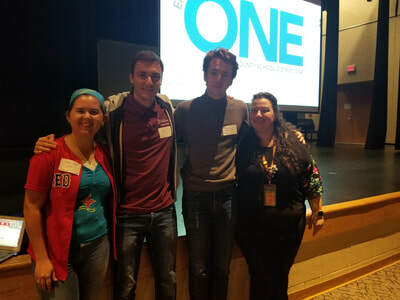 The German classes had a blast at Lowcountry German Day, organized by the College of Charleston and shared the experience with the “Frenchies” by also welcoming the two ambassadors from USC Thinking Globally Ambassadors, as guest speakers. 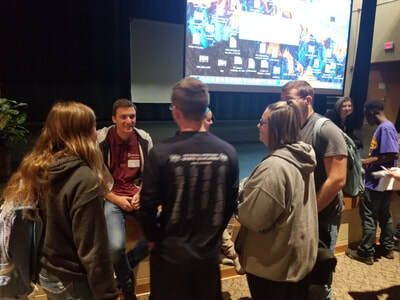 On the fieldtrip to College of Charleston, the German students got to hear from college graduates how the language has helped them in their careers and/or get into grad school. They also got to interact with other students across the state in German. It so was exciting seeing our WL students using their non-native languages! 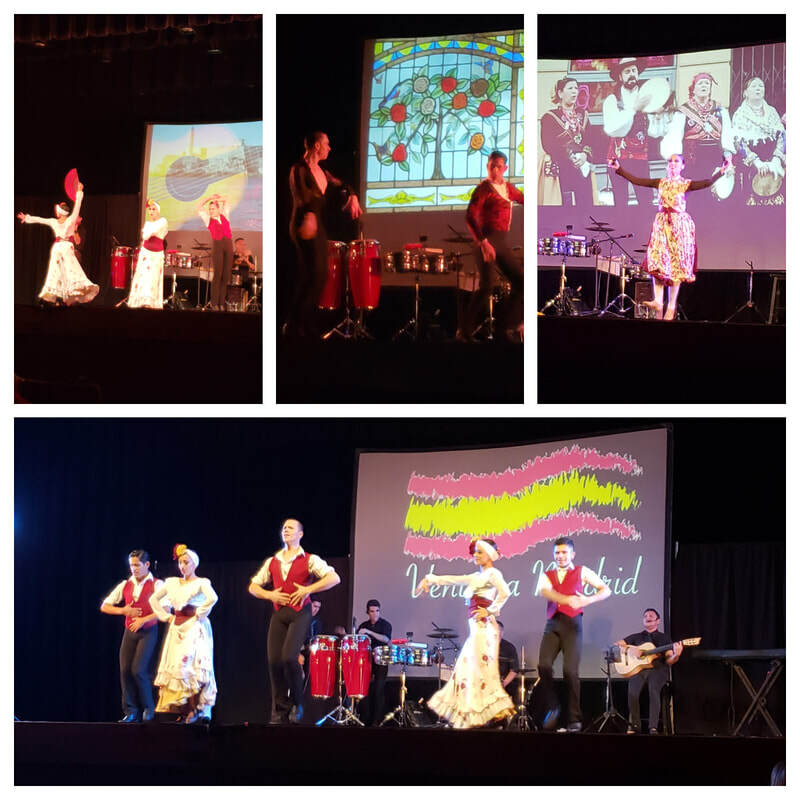 The Spanish classes travelled to the Hispanic Flamenco Ballet in Columbia and watched a show designed to not only entertain, but to enlighten, giving students a different perspective on the Hispanic culture. Students also used their food ordering skills for lunch at the Mexican restaurant San Jose. 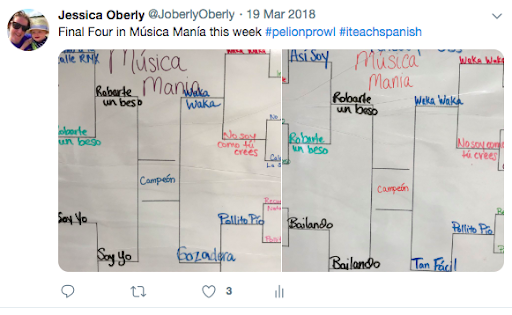 In addition to students going to the Flamenco Ballet, students who stayed behind explored the dances of other Spanish-speaking countries via Internet. ​With the holiday season coming up, GHS can only wish for more culturally rich times, like the months of November and December were! money by being an influencer on Instagram." Her directions go on to encourage students to create a theme that sets them apart from all of the other aspiring Instagram Influencers out there (a rapidly growing field), and helps them create their own hashtag and profile. In order to insure internet safety, Ms. Latham has students creating their "Instagram profiles" through SeeSaw instead of actually creating accounts on Instagram. However, they are developing many of the Power Skills highlighted in our Strategic Plan, and real world skills they could immediately transfer to Social Media networking if they decide to do that in the future. 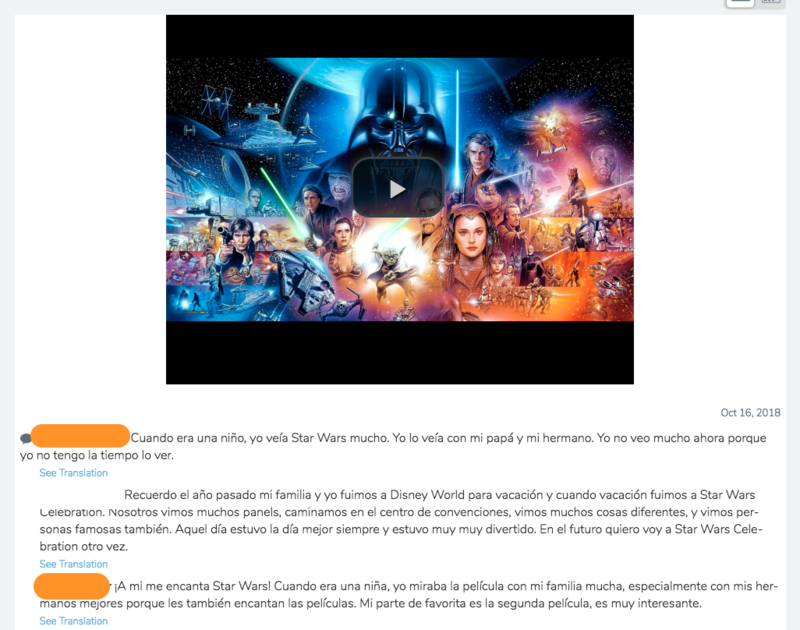 Below I've shared screen shots from her students' work on SeeSaw. 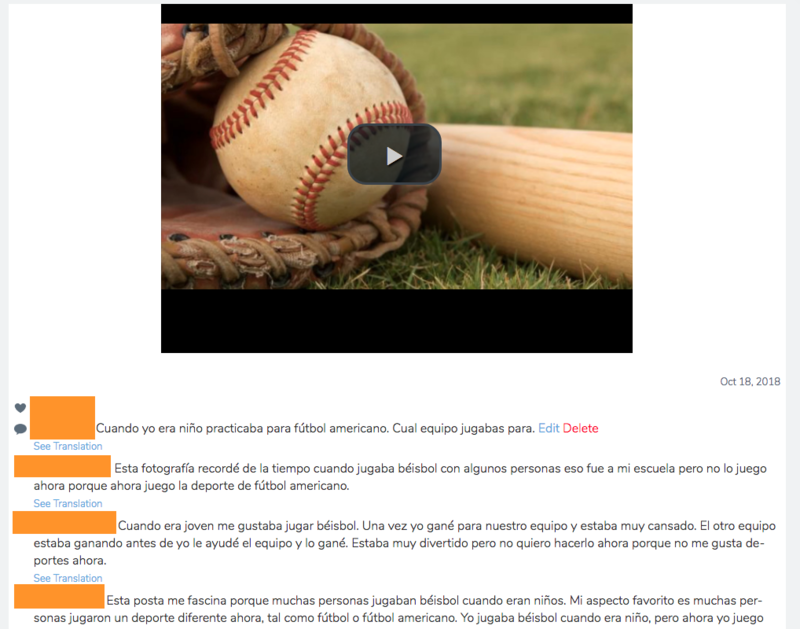 You cannot click on the videos, but students created an introductory video, and then other students (both within our district, and from other schools across SC) are interacting and responding in Spanish. You will of course notice that their grammar and spelling is not perfect, but they are communicating with their peers about topics that interest them, and that fall within the Memories unit of Level 3. 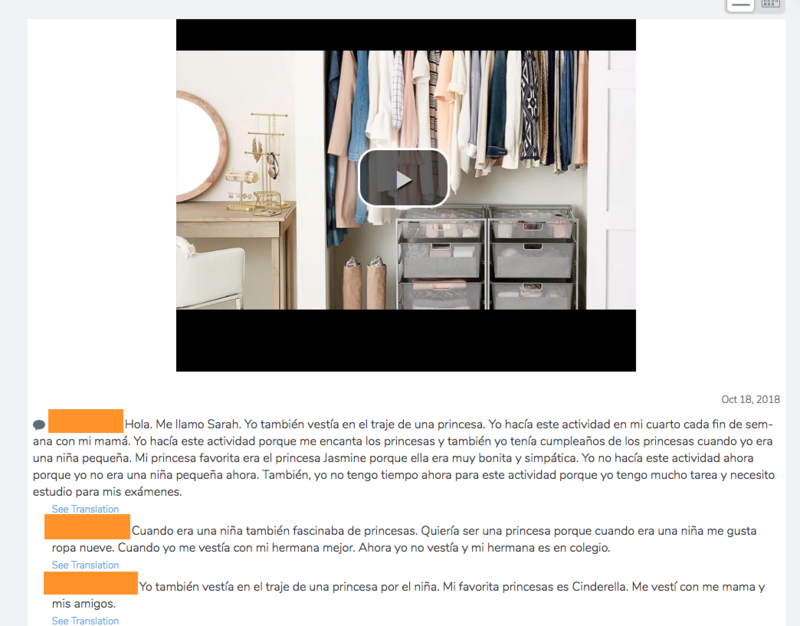 Here you will notice that students are making personal connections to topics that interest them, as well as practicing the past tense verbs. Again, we are not expecting perfection at this level, but we know that using grammar in context is much more effective for long-term use and memory than grammar drills. If you are interested in finding out more about this project, Ms. Latham will be presenting at SCOLT 2019 in Myrtle Beach. You can also contact her at jlatham@lexington1.net. Bon dia, y bon bini!/Good morning and welcome! Today I learned how to say a few phrases in Papiamento, one of the four languages that are spoken in Aruba. 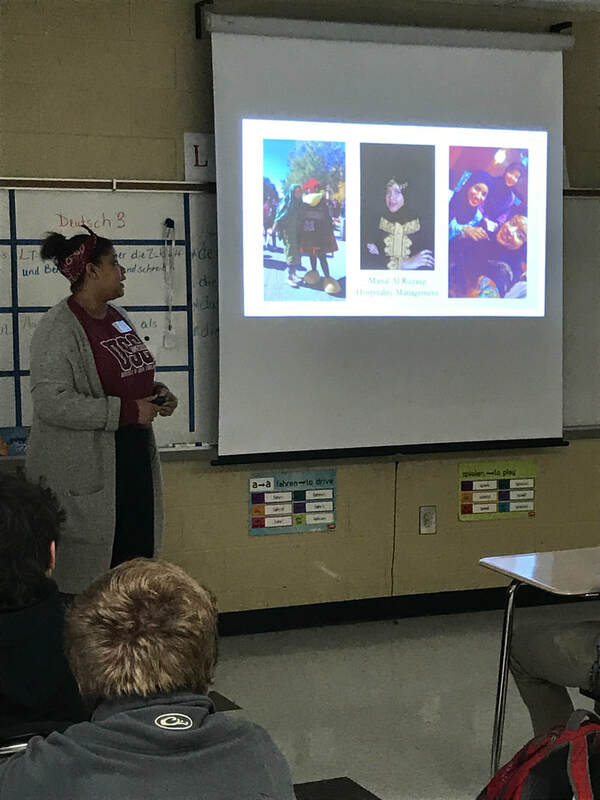 I, along with WL students at Pelion High School, had the honor of hearing from three International Student Ambassadors who are part of the Thinking Globally program which is organized through USC's Department of International Student Services. 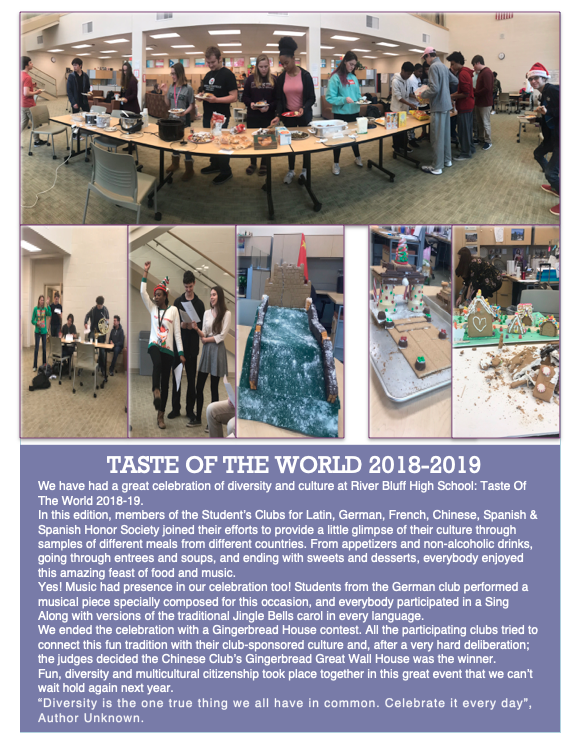 Their mission is to promote intercultural enlightenment through cultural presentations across the midlands, and I must say that I was impressed by these international students. They are full time students at USC who volunteer their time to talk with people about their countries and their culture, and I believe our students at PHS were impressed by how similar these students are to us, even though they have different backgrounds, languages and cultures. The countries represented today were France, Germany and Aruba, and some students didn't even know that Aruba existed until today. Other students were curious to hear about French cuisine, yes they eat snails, the German Autobahn, and Aruban New Year's traditions. 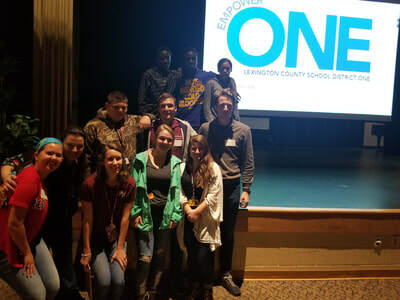 It was exciting to share in this multi-cultural event, and a big thank you to PHS WL teachers for organizing it. If you are interested in inviting Thinking Globally to your school, check out their website, or talk to Elizabeth Ben Yahia at Pelion High. Welcome back WL friends! I know it's been an interesting start to the year, with our unscheduled "Fall Break," but hopefully we've all settled back into our routines and are making up for lost instructional time as we near the end of the first nine weeks. As you all know, our new vision for Lexington One is "Empowering each Child to Design the Future." 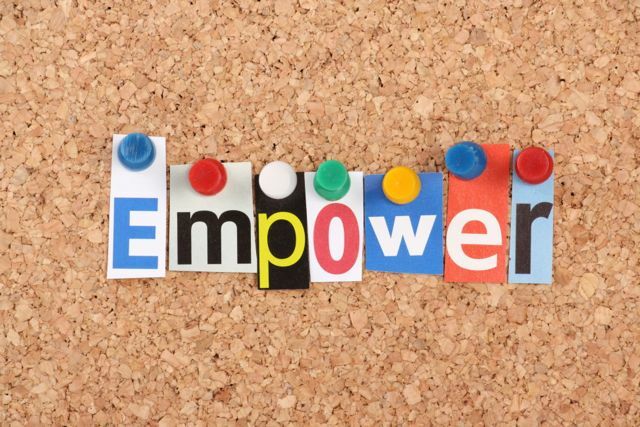 Last year many of you felt empowered to share out with the district the excellent learning opportunities you provided for students. I wanted to put out the call for guest bloggers this year. If anyone would like to share what's going on in your classrooms, I will happily post for you, just send me your write up, and a few pictures. Our work in World Languages is vital to the success of our students and in helping each child design a more global future. In other news, I wanted to share an exciting announcement. 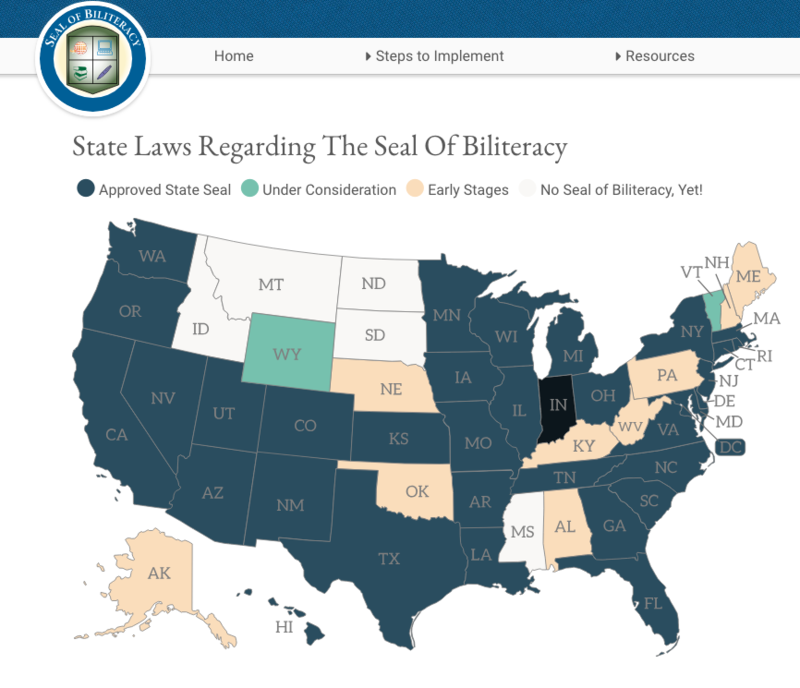 South Carolina is now officially a state that recognizes and awards the National Seal of Biliteracy! "The Seal of Biliteracy is an award given by a school, district, or state in recognition of students who have studied and attained proficiency in two or more languages by high school graduation." We believe that this will continue to add value to the work we and our students do each day, and I look forward to seeing how many of our graduates this year will earn the seal of biliteracy. For more information, check out the national website: sealofbiliteracy.org/index.php, and you can also stay tuned as we will forward out more specific information as we have it. This week I had the pleasure of attending two fantastic learning events at Red Bank Elementary. The fourth grade team collaborated across all content areas on their Westward Expansion unit which culminated in a Musical presentation of "To the West." After the musical, fourth grade immersion students presented their interactive, multi-media projects in Spanish and English on various aspects of Westward expansion, also integrating topics such as animals and their habitat, food groups as well as the types of home and weather conditions from that geographical region during that time period. I also got to witness first grade Spanish immersion students sharing their integrated science and literacy unit on plants with the immersion kindergarteners. They performed a poem, then they shared photos of the plants they grew along with drawings and observations. They also read books about plants to their kindergarten friends. 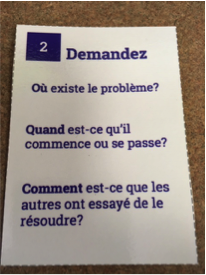 It was inspiring to say the least to see how teachers are integrating content, language and literacy. Great job Red Bank! Thanks for all your hard work.